Apparently there’s some rule for Malaysian street footie that the team conceding the first goal has to play with their shirts off. I guess back in UK we weren’t so shy, we just whipped our shirts off anyway. It’s common to play skins and shirts so you can distinguish the teams without experience kits or uniforms. Anyway this is where the phrase Jangan Togel comes from, you can of course check out more on the Nike Football site. It’s a pretty interesting concept, and I think advertising wise it’s interesting that Nike is appealing more to street and youth culture by appealing to the Malaysian specific ‘togel’ culture of street football. 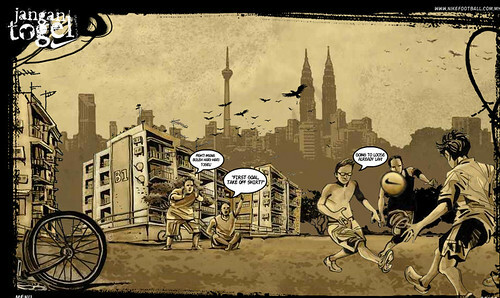 You can grab the Jangan Togel comic, wallpaper and more over at the Jangan Togel Nike Football site. The track playing on the site is ï¿½My Generationï¿½ by local indie outfit, SevenCollar T-Shirt. Itï¿½s also free for download at Jangan Togelï¿½s website. Support local artists! I hope the artwork was by a local too. It has a nice comicbook feel to it. Many a time I’ve played shirts or skins … though, I found when girls wanted to play for some reason they always refused to play shirts!!! Some matches I’ve played in we just chose one side to have everyone in the most popular coloured shirt and almost everyone else goes on the other team. Example, if ten guys have white shirts, they go on one team and if there are 12 other guys, then we’d chose someone else with a ‘unique’ shirt to join the white side … that sort fo thing. Nowadays everyone plays futsal and togel is no longer practised. Everyone’s in full gear – boots, jerseys, etc. Other than being used to distinguish team mates, it’s also for the passer-bys or late comers to know which team scored first. (Why this matters I don’t know). 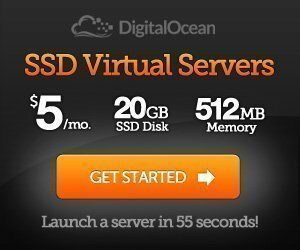 Cool site! Love the comicbook drawings… would be great as a wallpaper. maybe one of your “adoring” fans posted it there. Handsome guy! Now I understand what the term meant? Was wondering whether it was in Bahasa Indonesia, or our very own BM. Nice concept. It’s nice to see multinational corps using “local content”. Unrelated, but nice work to the comments section. Looks much better and easier to read. and BTW, is Christine a “SPAM”? 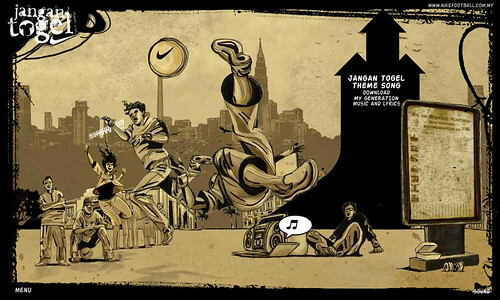 cool comic graphic huh… but why my nuffnang add is different? Dabido: Hmm that’s an interesting system, that could work too..Although it is a little more complex than skins vs shirts. adrian: Aye I guess people have money for kit now, I’m sure togel is still played in more rural or lower income urban areas. Paul: There is a wallpaper for download on the site. Jason: Yeah, some kind of old style slang I think. v0ices: Yeah I think it’s a positive campaign and a good idea by them. Thanks, comments is easier to read now, was pretty bad before..and yeah I suspected Christine was spamming too, have removed the links. d’Fish: It depends what campaigns your blog gets chosen for.